A reader (?) sent a paper from Cato which essentially argues that beyond a certain level, public assistance creates poverty. That coincides with what I have long believed and tried to show. Behavioural responses that are self-destructive either individually and/or family-wise will undermine the worthy goals of alleviating need. Here are a couple of the tables from the paper. Reason.com has yet another example of how the US child care and protection authorities are horribly overreacting. A mom, dad, and their preschooler went to Home Depot in Valley Stream, Long Island, last Saturday to get some Christmas lights. The boy fell asleep in the car, so the parents cracked open the sun roof and let him snooze while they ran their errand. A passerby saw the boy and called 911 to report a child in a car, "unconscious." When the parents came out about 20 minutes later (the lights had been hard to find), they found a huge commotion at their car. Cops! Firemen! An ambulance! A fireman had smashed open their rear passenger window and was extricating their son as if the car was on fire. Then, rather than seeing that the boy was startled but fine, the safety kabuki began. "Now, maybe you wouldn't let your child wait in the car for 20 minutes. But chances are that your parents did that with you, because this was once universally acceptable." It's true. As children we were always left in the car when my mother did the supermarket shopping. She would not have dreamed of dragging us around with her. And she was a teacher. The DomPost today ran a piece which is part of a series entitled, "Private Business, Public Failure: Inside Our Prisons". 'Incarceration Nation' (DomPost, December 12) featured Auckland University sociologist Dr Tracey McIntosh claiming that from the time of European settlement "...there was a desire to incarcerate significant numbers of our people", 'our people' being Maori. This is simply not true. According to the Official New Zealand Yearbook of 1900, of the admissions to prison in 1898, Maori numbered only 134 of 1,724 - or 7.8 percent. That year more women than Maori were admitted to prison. The significant growth in the Maori prison population share - 51 percent at September 2016 - came with urbanisation and welfarism. For working people, the legacy of the Key government has been eight years of austerity. Key has overseen thousands of job cuts and a decline in median incomes, almost destroyed the coal mining industry, increased the goods and services tax, cut taxes for the rich and slashed spending on healthcare and welfare services. An estimated one in four children is living in poverty and 41,000 people are homeless due to the soaring cost of housing. Large parts of the country have been de-industrialised and economically shattered. 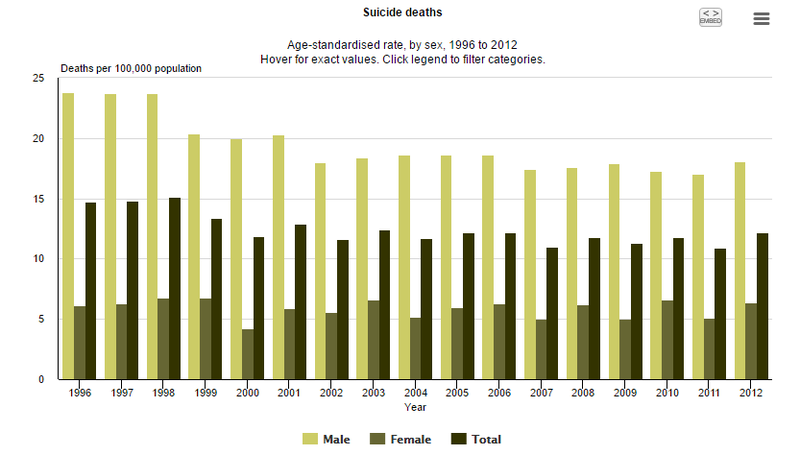 Suicides have reached record levels two years in a row. Thousands of job cuts and thousands of jobs created. In 2008 2.188 million people were employed. In September 2016 there were 2.493. The unemployment rate is 4.9 percent. Prior to the GFC - not of Mr Key's personal making - unemployment was under 4%. New Zealand ranks 10th in the OECD ahead of 24 other countries. "....median household income continued the rising trend shown in the post-GFC recovery phase – on average this has been at 3% pa in real terms (ie 3% pa above CPI inflation)." 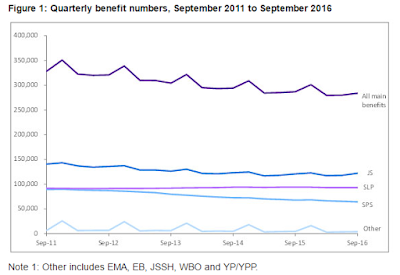 Spending on healthcare and welfare services has not been slashed. See 2016 Core Crown Expenses. "....the AHC 60% anchored line measure, the poverty rate for children fell from its pre-recession rate of 24% to an average of 22% in 2014 and 2015"
"....there is no evidence of any rising child poverty trend in recent years using the anchored line AHC or BHC measures.....the rate for more severe hardship in 2014 and 2015 (8%) is close to what it was before and during the GFC with those in deeper hardship not greatly impacted by either the downturn or the recovery." "...more than 41,000 people were staying in severely crowded houses with family or friends, or in boarding houses, camping grounds, in cars or on the street." If 41,000 people were strictly homeless why are only 4,600 currently on the housing register? 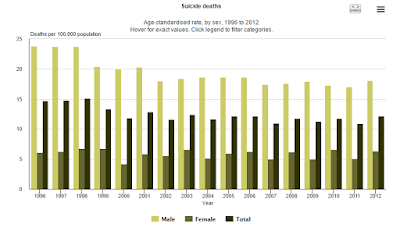 And finally, the number of suicides is reasonably steady. It's all lies. But I've heard plenty of ignorant people venting this sort of rubbish over the past two days. No wonder the PM has had enough. From last week's report, Child Abuse and Family Structure: What is the evidence telling us? "For those children whose caregiver had spent ‘more than 80%’ of their time on a benefit in the last five years, 11.3% would have a finding of abuse. Those who had ‘no time’ on benefit had an abuse finding of just 0.3%. The likelihood of abuse for the first group was almost 38 times greater than for those with no benefit history." Of those children born in 2010 who'd been abused or neglected by age two, 76 percent were born into a single-parent setting. This startling fact comes from government research which received little or no publicity. Why? Bureaucratic discomfort over the increasing evidence of poorer outcomes for children of single parent, welfare-dependent parents is one reason. A 2006 Ministry of Social Development paper claimed, for example, "It would be inappropriate ... to suggest the risk of fatal child maltreatment is higher on the basis of being a child of a sole parent or a child having a low birth weight." 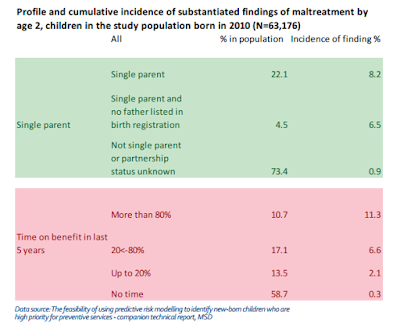 Yet further government data shows 'step-fathers' - or partners of single parents - are strongly over-represented in child deaths from maltreatment. Only relatively recently has cross-departmental data been used to analyse which children are at highest risk of maltreatment. Other countries have been cross-analysing their care and protection data for many years revealing the same relationship between the increased risk of child abuse and single/non-biological cohabiting families. 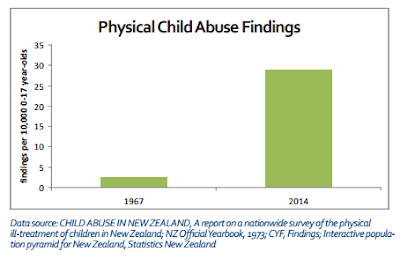 In New Zealand, the over-representation of Maori and Pacific children in maltreatment statistics dates back to the first nationwide survey conducted in 1967. Common reasons given for this over-representation are poverty, unemployment and, in the case of Maori, the effects of colonisation. Evidence suggests however that the greater occurrence of single parent families - stressed mothers and serial changes of non-related male caregivers - is behind these elevated child abuse statistics. Conversely, Asian children have the lowest rate of abuse and the lowest rate of one parent families. Of the 2010 cohort referred to earlier, the children whose parent or caregiver had spent more than 80% of the last five years on welfare were 38 times more likely to be abused or neglected by age two than those whose parent(s) had spent no time on welfare. 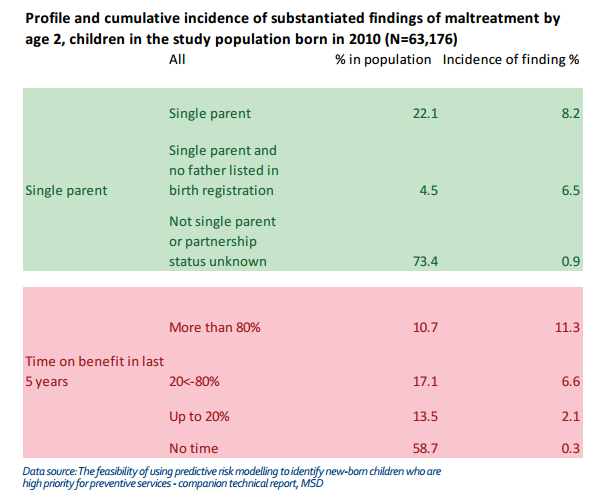 The children born into a single parent setting (based on birth registration or benefit data) were 9 times more likely to suffer maltreatment than those children born into two parent families. Maori children with two parents who did not rely on welfare had very low rates of abuse similar to those of non-Maori children in the same circumstances. In 1967, when marriage was almost universal among parents and sole-parent welfare dependence virtually non-existent, the rate of physical child abuse was 2.5 substantiated cases per 10,000 children. By 2014 that rate had risen to 29 cases per 10,000. This more than ten-fold increase has been accompanied by a decline in marriage and committed two parent families. It is likely to be argued that ‘correlation does not equal causation’. While true to a certain extent, the correlations between child abuse and family structure, and child abuse and benefit-dependence, are stronger than the most commonly advanced correlative factor - poverty. When over three quarters of substantiated abuse findings by age two are from single-parent, benefit-dependent families, the coincidence is too large to dismiss. It might also be argued the increase resulted from a lower tolerance to child abuse due to changed societal values, public awareness campaigns, and subsequently, more reporting. But using a more objective measure - assault-related hospitalisations of children - the rate is still four-fold that of the 1960s. Another important factor ignored for too long: biological fathers generally provide a protective factor against child maltreatment. Furthermore, the chances of the father - and his extended family - remaining in the child's life are significantly increased when the parents are married. In discussions about the unacceptable level of child abuse and neglect in New Zealand, the breakdown of the nuclear family is the elephant in the room that many would prefer to ignore. Yet to do so is an abrogation of our collective responsibility to children. The committed two parent family provides the safest environment for children. 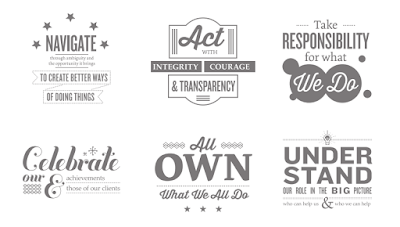 The traditional family model is still fit for purpose. It is just unfashionable, and in some minds, unforgivable to say so. Child Abuse and Family Structure: What is the evidence telling us? 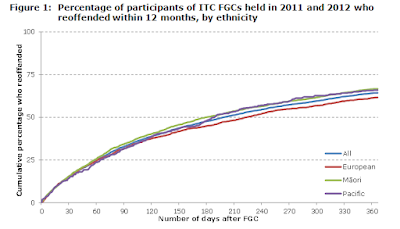 follows on from Child Poverty and Family Structure: What is the evidence telling us? published in May 2016. It is the second report written for Family First by social researcher and commentator Lindsay Mitchell. Trump has appointed a charter school advocate as Secretary of Education. She says the status quo in the US education system is "unacceptable." Teacher's unions are apparently not pleased. I've blogged about this relentless regression only recently. The trouble began in Vynfields. The punters didn't cause the trouble, not a flicker of it, we were just smiling at a world that smiled back. But then a policeman and two policewomen came in. They inserted themselves into the small dancing crowd in front of the stage. They were literally looking for trouble. It was so sinister, I decided to keep an eye on them. The employment subsidy will be available for businesses in Kaikoura, Cheviot, Waiau, Rotherham, Mt Lyford and Ward who face a dramatic drop in their turnover as a direct result of the earthquakes and the closure of State Highway One. It will be paid to businesses with fewer than 20 employees where closure of the state highway and damage to the coastal environment means they cannot operate and they cannot pay staff wages. Naturally outsiders sympathize with those economically affected by the quake. But the collective and compulsory way we organise and protect ourselves means that arbitrary lines will be drawn by bureaucrats who are necessarily disconnected. Kaikoura business Whale Watch, for example, won't qualify. The assumption that they are bigger, stronger and more resilient ignores that they have greater outgoings. But if people had voluntary and enhanced choice about protecting themselves and their businesses, outcomes may be less fickle and jarring. This is cruel. But it more than amply highlights that perverse phenomenon whereby people politically aligned can be each other's harshest critics. The Maori Party is putting the hard word on Labour's Maori MPs to oppose one of their own Member's Bill's that abolishes charter schools. The Bill, belonging to Labour MP Chris Hipkins is due to be debated in Parliament later today. Maori Party Co-leader Te Ururoa Flavell said Labour's Maori MPs know in their heart of hearts, because they have family members actively involved in charter schools, that the schools are achieving results upwards of 10, 20, and 30 percent of the national average, particularly those in Te Tai Tokerau. Normally behind a paywall the New York Times is free for a "few days". A campaign has been launched by the Lung Foundation to reduce the stigma of lung cancer. The aim is to reduce stigma surrounding the disease and advocate for better treatments, government funding and symptom awareness. While all the time other government-funded agencies are hell-bent on demonising smokers at least partially because of the burden they impose on the health system. Yes, I am aware that tobacco tax already covers smoker's health costs (who apparently make up 80 percent of lung cancer patients) but you can't have it both ways. An activity cannot be stigmatised and the outcome de-stigmatised. In retrospect, one could almost feel sheepish about the accusations of Nanny Statism hurled at Clark in her final months. Political commentators would have it that excessive paternalism lost Clark the 2008 election. National made a song and dance of reviewing silly and burdensome regulations but the neurotic back-saving health and safety stuff marches on. I gave you a perfect example this morning of accelerating meddling madness. The crusades against alcohol, tobacco and obesity are only gathering momentum. Legislatively this manifested in lowering the drink/drive alcohol limits (pubs go out of business against a backdrop of a rising road toll) and ongoing tobacco tax hikes (creating a lucrative source of income for criminals and much danger for legal sellers). No relenting to sugar tax demands yet but what are the odds? Bureaucracy is like a fungus. Growing wherever the conditions enable it. Quietly spreading. It is impervious to changes of government. Especially when the so-called political 'masters' are tired. At this point I am quite disillusioned with National. If that is possible, when no torch was held for them at the outset. Gareth Morgan says he wants to free New Zealand from the grip of "career politicians". That's what is being reported. If Labour was in power, I could understand the sentiment. But at the moment the most powerful politicians in New Zealand are John Key, Steven Joyce, Paula Bennett, Anne Tolley, Chris Finlayson and Judith Collins. None are career politicians. You may add others. I simply listed those who control portfolios I take an interest in. I left out Bill English and Nick whats-his-name. They are careerists based on parliamentary longevity. So is Morgan indicating he would (if successful) support the current government? Ironically Andrew Little is saying, "Great to see him in our corner." 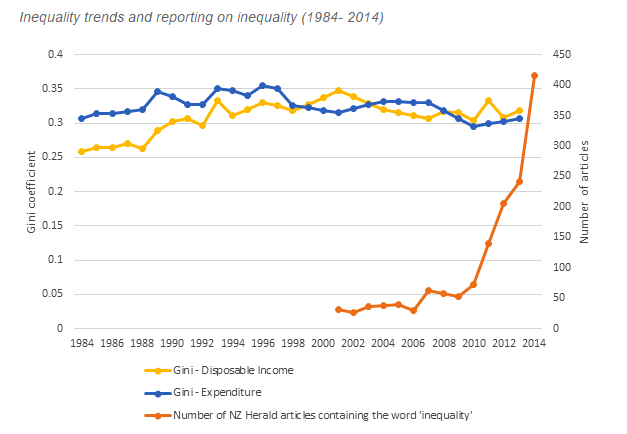 RNZ has a fairly good piece pointing out the likely direction of Morgan's policies. People should be aware that his Big Kahuna plan - essentially a Universal Basic Income - would make most single parents and Superannuitants poorer. The government passed the Vulnerable Children Act in 2014. The new legislation required every person who works with children to be police vetted - the existing workforce and periodically. I and others expressed concerns about this 'sledgehammer to crack a walnut' approach. This is already causing problems hiring EEC teachers. The vetting process is taking too long requiring 23 staff, due to rise to 28. Now there is legislation afoot to allow the police to charge for the service. Remember, the Act was intended to protect vulnerable children. But here's the latest piece of madness. It requires that every person supervising an NCEA exam be police vetted for their safety. Have there been any problems that would pre-empt this new requirement? Haven't people supervised NCEA and earlier exams for years without incident? We live in a country that allows, no, encourages children as meal tickets; that actively discourages responsibility for fertility by picking up the tab; and that actively demotes fathers. This is what leads to the abuse and neglect of children. And occasionally, the deaths of. When Paul was a Radio Pacific talk back host in the 1990s I listened avidly. I communicated enthusiastically and regularly by fax. Such old hat technology now. In part, It was Henry's (reflected) despair about the connection between the tragedy of Lilybing and the taxpayer that set me off on a trajectory against welfare. Now I don't get him. Oh. Maybe he has moved way beyond what 'normal' people experience so we mustn't judge him within those confines. I can't stand Lizzie Marvelley. She'll no longer go on his show because he doesn't respect women. What is this rush to the bottom? BUT there are so many more words at our disposal. When did Henry forget this? 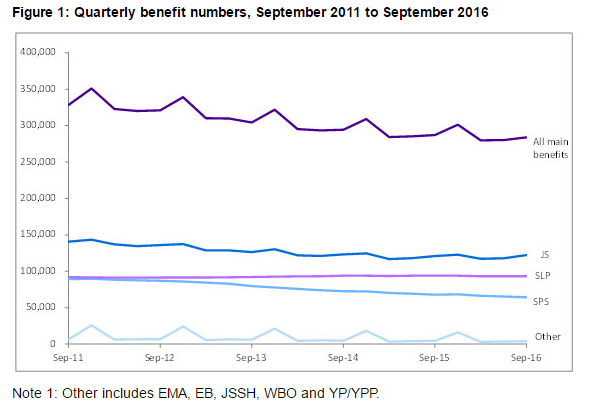 The latest benefit stats are a mixed bag. That'll be why they haven't made the news. Not a lot to criticise and not a lot to crow about. For instance, over the year to September 2016, "... the number of recipients of Jobseeker Support increased by 1,383, or 1.1 percent." The rise is nearly all female; Maori and Pacific. The drop in sole parents numbers is quite substantial - "....the number of recipients of Sole Parent Support decreased by 3,515, or 5.2 percent." But (given the nature of the rise in Jobseeker numbers) I suspect that some of this reduction will actually be a transfer of older sole parents onto Jobseeker as their youngest child turns 14. 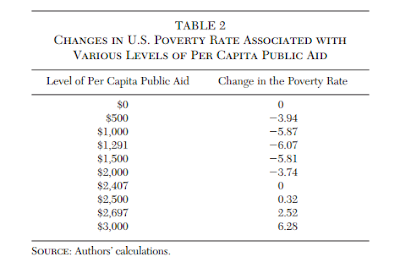 Regarding the last main benefit, "...the number of recipients of Supported Living Payment remained relatively stable, decreasing by 593, or 0.6 percent." 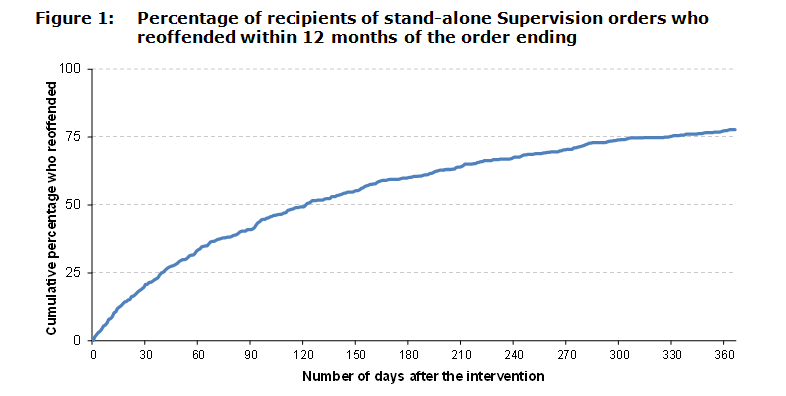 For many years the numbers on an invalid benefit only grew so even stability is an improvement. HOWEVER, the upward trend in people receiving a Supported Living Payment for a psychological or psychiatric condition continues. 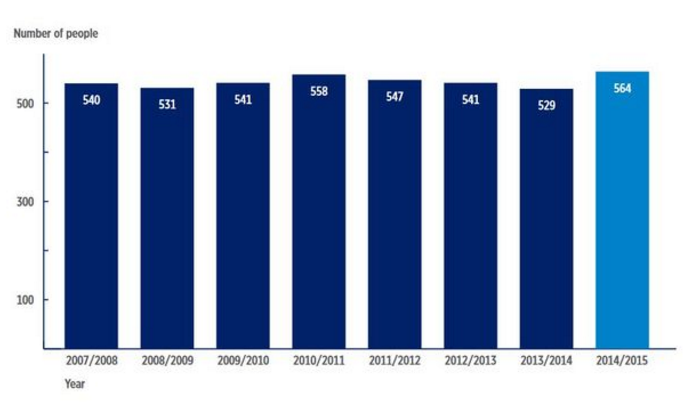 A further 765 were added over the year. There was a marked increase in Pacific people becoming dependent on this benefit and the age group with the largest growth was 25-39 years. 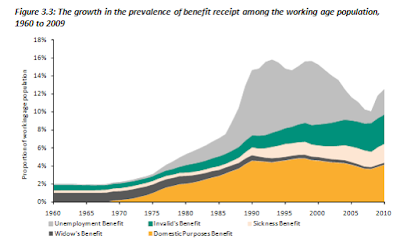 Overall, "...the number of main benefit recipients decreased by 3,292, or 1.1 percent." At this rate (assuming a static population) it will only take around 69 years to get back to a level where only 2 percent of the working age population is reliant on a benefit - the sort of level that was normal until the 1970s! Cutting the funding to the Growing up in New Zealand Study is consistent with this government's focus on the neediest, most vulnerable, children. The initial cohort for the study was just over 7,000 children. But by 2014 the retention rate was only 92%. I believe that the drop-outs would largely have been the very families the government is keen to track. I base this on the data collected about benefits. The numbers are too low. The families that have dropped out of the study would probably have been beneficiary families. 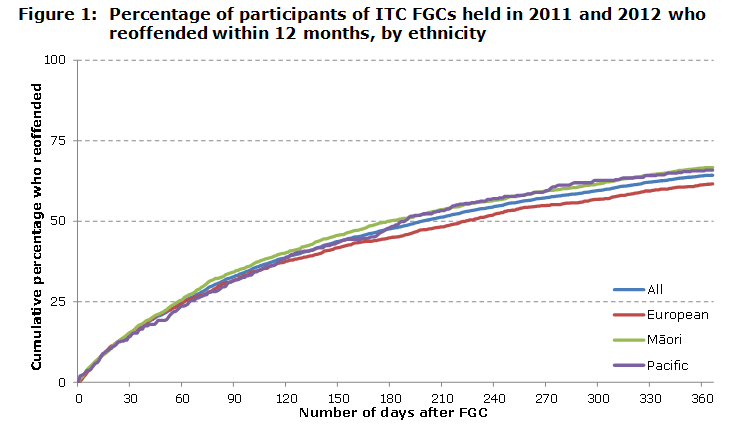 Now the funding has been reduced and the study has to cut the cohort to 2,000. This is still a useful sample size when compared to earlier longitudinal studies like the Dunedin Multidisciplinary Study (1037 babies born Dunedin 1972-73 with a current retention rate of 95%) and the Christchurch Health and Development Study (1,265 born 1977) which have produced masses of interesting data and papers. No doubt this "gutting" is a re-prioritization of public funds. 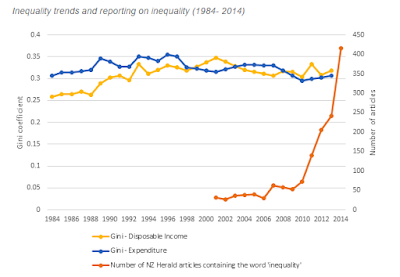 Of particular interest to me, given the report I wrote for Family First earlier in the year which suggested changing family structure is the major factor driving child poverty, the NZ Initiative report finds that around half of the big increase in inequality, that occurred between the mid eighties and mid nineties was due to changing family structure and households. 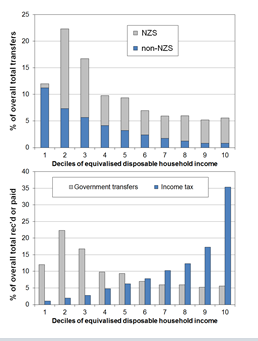 "...the main factors which contributed to the change in inequality were changes in family and household structure (primarily a pronounced drop in the fraction of two parent households and a rise in the fraction of sole parent households), and changes in the socio-demographic attributes of households "
Bryan Perry authors the government's (Ministry of Social Development) official report into household incomes in New Zealand. The latest was published a few weeks ago. It runs to 250 pages. I cannot claim to sit down and read it cover to cover but I have found time to peruse it more closely today. Perry details five examples of "common misunderstanding or misleading use" of his statistics. Naturally the US media are attacking presidential candidate Gary Johnson for his 'radical' ideas. From Jacob Hornberger, explaining why libertarians are not the radicals. Guess who the radicals were in the late 1800s and early 1900s. The socialists and interventionists! That is, those Americans who were proposing programs like income taxation, national health care, minimum-wage laws, maximum-hours legislation, and public (i.e., government) schooling, all which they were importing from socialists in Germany. It was those statists who were considered by our American ancestors to be radicals who were trying to shift America from a free-market economy way of life to socialism and interventionism. Let’s not forget what those radical statists were saying when they were battling for the enactment of the Sixteenth Amendment in 1913. They were saying, “We promise that if we are permitted to bring income taxation to America, it will only be levied on the rich — and even then, it will only be a very small percentage of taxation on the rich.” It was an unvarnished appeal to the great sins of envy and covetousness. 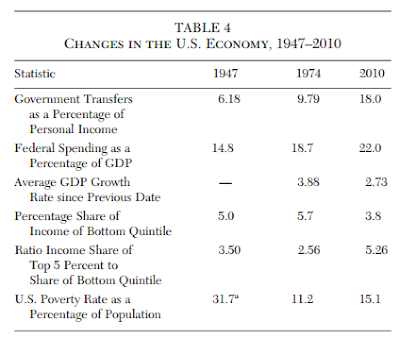 As Thomas and others of his socialist and interventionist ilk know full well, income tax didn’t end up being limited to the rich and the percentage didn’t stay small for long. Instead, like a metastasizing cancer it spread throughout the middle class and even to the poor, to the point where many people today, especially the young, can’t make ends meet. New Zealand should emulate the United Kingdom. [Max Rashbrooke] said New Zealand should follow Britain's lead and pass a Child Poverty Act, which would set out measures and targets, as well as a plan of meeting them. "It's about taking a comprehensive approach so I think we need to start with measures, start with a plan and then I think the right actions will flow out of that." Moreover, there is nothing new about governments setting child poverty-reduction targets. Governments around the world have done so for many years. In Britain a Child Poverty Act was enacted in 2010 with cross-party support committing governments to setting and achieving specific targets to curb child poverty. “A decade ago, when David Cameron became party leader, he promised that under his leadership his party would measure and act on child poverty. It’s a tragedy that we are now talking about rises in child poverty not falls. It’s also hugely depressing that at a time when we’re seeing rising child poverty the Government has passed legislation that eliminates its target to reduce child poverty, or even to report on the progress it is making." The government is to scrap its child poverty target and replace it with a new duty to report levels of educational attainment, worklessness and addiction, rather than relative material disadvantage, work and pensions secretary Iain Duncan Smith has said.The old target set by Tony Blair, based on the percentage of households with below average income, will continue to be published as a government statistic – but will no longer be seen as a target. Out of touch or just willfully ignorant? Anyone planning their summer holiday will already be thinking about the logistics - the plane tickets, the car hire, the hotel bookings, and so on. But before they get onto those things, they'll have decided on one key point: where they're actually going for their holiday, and when. The same point applies to government policy, and the currently hot topic of tackling child poverty. The first thing is to know where you're going: how much you want to reduce child poverty, and by what date. He contends that the government has done none of this latter planning. I thought when I started reading Rashbrooke's opening he was going to allude to the thousands of children whose families can't go on holiday once a year. Not being able to afford an annual holiday is now just one item on a list of family shortfalls indicating material hardship. So should the government start subsidizing poor-family holidays as part of the demanded percentage reduction in child poverty? Most people would think that insulating damp state houses might take priority. Or upping immunization rates. Or funding 'home-for-life' parents who take on the most needy, damaged and disadvantaged children there are. This is the point the Prime Minister is making to those who want a blanket catch-all child poverty reduction target. Many children in income poverty experience no hardship. Others, whose income is above the poverty threshold, are experiencing a number of deprivations. Many children in families on benefits have worse outcomes than children in families who work, even when their incomes are similar. The reasons why are nuanced. But poor working families are more likely to have two parents and budget better. Policy needs to deal with those nuances. This government, more than any before, has attempted to cross-identify data from a number of agencies that deal with children and their families - MSD, IRD, Corrections, Health and Education - to find those children most at risk of living unhappy, unsafe, unhealthy, and unfulfilled lives. Targeting whatever funding is available to those children is the correct and humane approach. The Labour Party has accepted the Children's Commissioner's challenge to reduce child poverty rates by 10 percent by the end of next year. Commissioner Andrew Becroft is urging National and Labour to work together to achieve the change. Mr Becroft wants a material deprivation measure to be used as the official benchmark for child poverty, under which 149,000 children would be considered to be living in hardship. 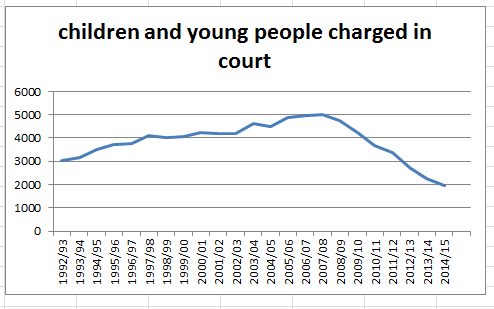 So the Commissioner is challenging government to reduce child poverty. What about challenging individuals? Why not, for instance, challenge couples to stay together and committed to their children? Or challenge people who are dependent on benefits not to add more babies? Or challenge young people to finish their education, pay off their loans and get jobs before they start families? What a difference changing poverty-inducing behaviours would make. But the new Commissioner has simply taken up the old demands. Disappointing. Very. 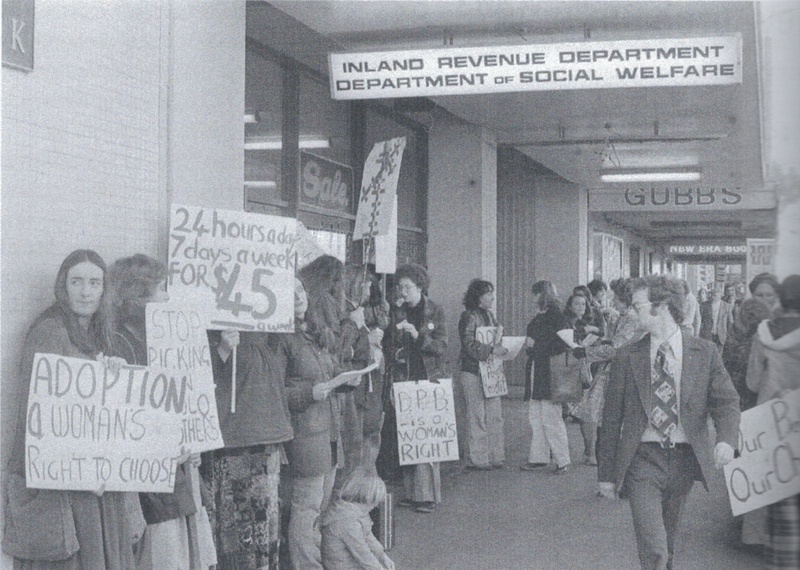 An interesting article appeared in the Daily Signal entitled, "What Happened When New Zealand Got Rid of Government Subsidies for Farmers." I can't vouch for the veracity of it. I wasn't living in NZ during the 1985 to 1991 period. But the very first comment post article echoes what I thought reading it. According to the 2014 US Census, 47.6 per cent of women go through their peak-fertility years (ages 15 to 44) without giving birth. This can only be read as 47.6% of women over 44 don't have children. A ridiculous claim. So I googled it, betting it was a mangling of some fact by the writer. Time reported that this pattern is particularly pronounced for women between 25 and 29 — 49.6 percent of women in that age group don’t have kids. Unsurprisingly, after age 30 those numbers drop and more women become moms. The survey found that 28.9 percent of women ages 30-34 are childfree. And it will drop further after age 34. 2.0 - Average number of children that women age 40 to 44 had given birth to as of 2014, down from 3.1 children in 1976, the year the Census Bureau first began collecting such data. The percentage of women in this age group who had ever given birth was 85 percent in 2014, down from 90 percent in 1976. So now we have 15% of women go through their peak fertility years (15-44) without giving birth. Fertility rates may be dropping, but not that fast. 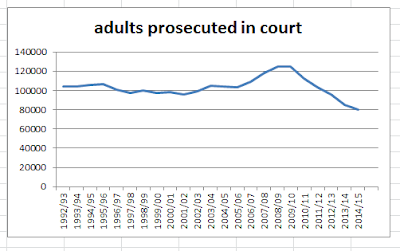 Court statistics - good news story? 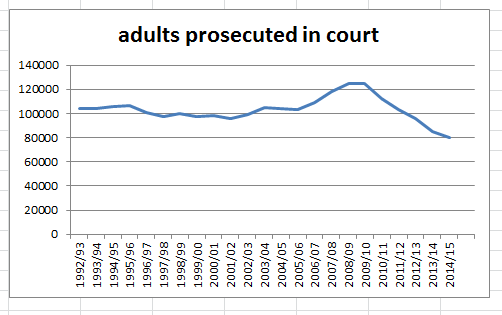 Coincidentally, on the same day that the country was reacting en masse to the discharge without conviction of a young rugby player who brutally assaulted a group of people on the street in Wellington, the latest youth court statistics were released. They show a continuing fall in the numbers of young people being charged. The Department of Corrections has embarked on a major recruitment drive and aims to employ around 600 new Corrections Officers by September 2017, with at least 500 of them coming from New Zealand. The new recruits are needed because the prison population is expected to reach 10,000 by 2017. 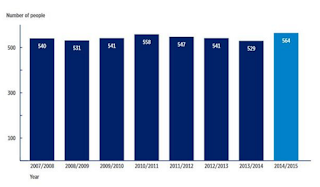 This increase is due to more people being held in prison on remand than previously. Legislative changes have also meant prisoners serve more of their sentence in prison, and there has been an increase in prisoners serving longer sentences for more serious crimes. NZ Lawyer recently published an article about the falling court statistics. I suspect that is the major reason. Not an improvement in behaviour. Serious offending continues at the same levels. I shouldn't read them. Lizzie Marvelly's columns always irritate me but they do provide an insight into the modern feminist's mind. Today she has been unusually arrogant - even by her standards - about David Seymour's comments this week suggesting that if a Women's Ministry was legitimate so should a Man's Ministry be. Not that he was promoting the formation of such. Rather, he was highlighting the inconsistency. During this otherwise celebratory week, however, I was unfortunate enough to stumble upon a publication entitled Free Press, which the Act Party seemingly sends out as a press release on a regular basis. On Suffrage Day (September 19), the Act Party decided to tell the nation (or more accurately, the small minority of New Zealanders who have nothing better to do with their time than read the party's public relations material) that there is no longer any need for a Minister for Women, when in fact, it is men who are disadvantaged. "Where once women were clearly marginalised, men are now behind in most social statistics," Free Press asserted, on a day dedicated to celebrating the still-challenged idea that women are as important as men. More men go to prison. More men commit suicide. More women graduate from university than men. Men even die earlier! Never mind the fact that women are paid less than men for the same work. Nor that women are more likely than men to suffer from mental illness. Nor that men commit the vast majority of the country's crimes. Though I generally try to avoid reading about anything the Act Party says or does out of concern for my sanity, the Free Press caught me by surprise. I'd almost have thought that a Suffrage Day issue dedicated to mansplaining was a joke, but that would require the Act Party to have a sense of humour and a shred of self-awareness. ....From a party that has had exactly zero female leaders in its 22-year history, perhaps the Free Press' stance is unsurprising. Ignorance, however, is no excuse. A female President is a female leader. The accusation of ignorance is somewhat ironic. Not that ACT would concern itself with gender parity because its core philosophy is individualism. Marvelly's is collectivism. But I am not sure she comprehends that. When you have no experience of what it's like to live in a world where another gender running the show is the way it's always been - from the fact that we've had only two female prime ministers out of 38, to the injustice of Sir Ed and Lord Rutherford receiving titles for their achievements while Kate Sheppard gave half the population the vote and was never made a dame - it must be hard to imagine. I have lived in that world rather longer than MS Marvelly and I often reflect on the freedom I have relished as a female, and a mother, a freedom furnished by a husband who has not had the same time or opportunity to pursue his every inclination because he has busied himself with supporting his family. Perhaps Ms Marvelly's father did the same. Perhaps not. But what about a little gratitude? If not to men especially, for the privilege you have enjoyed by dint of being born in a relatively peaceful, prosperous and civilized country. You don't know how lucky you are Lizzie. But voters will feel more confident in voting Labour if they are convinced that a Labour government will approach individual issues from a consistent viewpoint - one that will give priority to the values of tolerance, mutual respect, compassion, care for each other, and a recognition that "we're all in this together". "A ... term that is likely to be heard a lot, during election years especially, is "compassion." But what does it mean concretely? More often than not, in practice it means a willingness to spend the taxpayers' money in ways that will increase the spender's chances of getting reelected. If you are skeptical — or, worse yet, critical — of this practice, then you qualify for a different political label: "mean-spirited." A related political label is "greedy." In the political language of today, people who want to keep what they have earned are said to be "greedy," while those who wish to take their earnings from them and give it to others (who will vote for them in return) show "compassion." "
Here's a group advocating a universal basic income for all children of $40 a week. Lowell Manning, President of Basic Income New Zealand (BINZ) is calling for a Universal Basic Income for Children. “I like to call it a Kids’ Basic Income” he says. Mr Manning said that a Universal Basic Income for Children would work much better than tax cuts, substantially reducing child poverty in New Zealand and boosting the economy where it is needed. Referring to reports (Radio New Zealand 27th May on Nine to Noon), that Prime Minister John Key and Finance Minister Bill English would like to cut taxes by about $2-3 billion*, Manning says, “if we are serious about eliminating child poverty here in New Zealand, the Government is well placed to lead the world in 2017 by implementing a Universal Basic Income for Children”. “The Kids’ BI would be similar to the old Universal Family Benefit that ended in 1991 after 45 years of continuous use”, he said, “so the idea is neither new nor radical. What was radical was abolishing the Universal Family Benefit in the first place”. “Moreover, the $2.6 billion a year spent on the Kids’ Basic Income would generate more government revenue because the Kids’ Basic Income will increase national output, GDP, by about 1%, and the tax on that extra output will increase Government revenue more than tax cuts will”, said Mr Manning. “The Kids’ Basic Income is about the wellbeing of children, not family size or structure, ethnicity or social status” he concluded. I'd like some expert economic comment on that bit of maths. Sounds like the impossible task of standing in a bucket and trying to life yourself up by the handle. We cannot tax ourselves into prosperity etc. That not insignificant matter aside, I see a number of problems. The income would be paid to the parent. If it's like the old Family Benefit it would be paid to the mother. In other cases to whoever has legal custody I guess. But it'll be that person who decides how it is used. Yes, poorer parents will tend to spend it but the wealthier might choose to save it towards future costs eg university fees. So it cannot assumed it will automatically add to GDP. Second, the behavioural effect on those who would rather breed than work for an income is a worry. Third, how can it be fair to anyone who isn't a parent and aged 18 and over? They don't get any tax relief because proposed cuts would be going to parents with dependent children only. So those just starting out, many already burdened with student debt, become relatively poorer. Fourth, to really quibble, if all families with children receive the income boost, median household income rises as does the poverty threshold. On paper, relative child poverty persists. Finally, the universal family benefit was stopped in favour of targeting poorer children. This is a reversal. "This report describes changes in the offending outcomes observed for 79 young people who between October 2010 and December 2013 graduated from 11 Military-style Activity Camps (MACs) held at Te Puna Wai ō Tuhinapo youth justice residence in Christchurch. All of these young people had a post-MAC follow-up period of at least 12 months so their follow-up offending could be observed." "The reoffending outcomes ...for MAC graduates appear very similar to those seen for all young people who have received SwR orders. However caution must be taken with such a comparison, as measuring the impact of the MAC relative to SwR would require a robust statistical approach such as a matched comparison analysis. This could usefully be undertaken in the future." 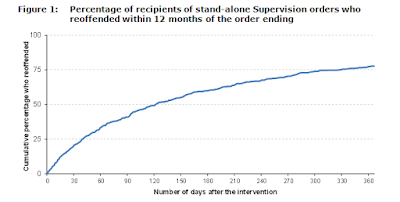 "Records for a total of 552 young people who received a stand-alone Supervision (SUP) order between 1 October 2010 and 31 March 2013 were examined." A final report looks at recidivism rate among those who went through a Family Group Conference process. The outcomes are slightly better but these are probably the less serious offenders. Based on these graphs the Military style camps had the least success. Offending by children aged 10-13 years has dropped in the last five years for both genders, across all ethnic groups and ages, across almost all offence types, and in all regions. A falling youth crime rate is not unique to New Zealand, and the reasons for the fall are unclear and therefore subject to debate. Much of the drop in offending by children in New Zealand has been because fewer children are becoming offenders in the first place – a very positive finding. "...Unicef NZ executive director Vivien Maidaborn, who was part of the delegation, said the panel had expressed concern about the new ministry. "The comment that was made was, 'I don't understand why you would call a Ministry the Ministry of Vulnerable Children when it could just have been the Ministry of Children. You're in danger of overtargeting towards vulnerable children at the expense of rights to all New Zealand children.'" Most New Zealand children do not need the government in their lives. They do not need a Ministry. Their parents give birth to them, care for and feed them, raise them and send them into the world without any help from a government agency that concerns itself with the care and protection of children. Sure they might receive some tax subsidy and use public education and health services but that is the nature of the beast right now. Around 3-5 percent of children are in circumstances that even a libertarian would acknowledge (in the absence of private charities) require state intervention. The argument is about the nature and timing of that intervention. Seriously, how can genuinely vulnerable children at risk of abuse, neglect, and failure to develop, be 'over-targeted'? New Zealand has every right to tackle its own problems in the way it believes will work best. I know what I would have said to the UN.